Alias Web Puzzle as it unfolds episode by episode. This summary of the puzzle is broken up into episodes since the elements of the puzzle seem to relate directly to the upcoming episode. It is set up so new visitors can solve some of the elements of the puzzle on their own or go directly to the solutions. There are no puzzle elements for the pilot episode or the Episodes 2 or 3. Episode 4 "A Broken Heart"
Comments: I believe I have what you are looking for. The URL is no longer active but when it was the following picture (posted to the forum by ahachickens) could be found. "So it looks like you and K-Directorate have something in common. You know, I could tell you the other half of the code, for I have seen it too, but it was long ago. But for now, I have something more interesting for you to look at. 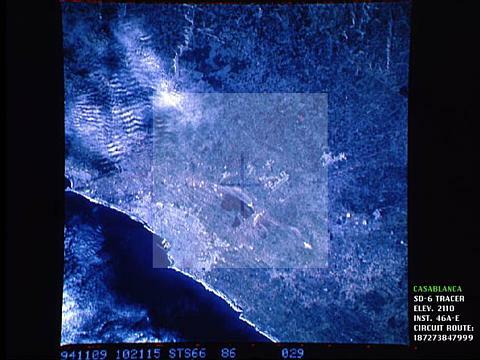 http://216.247.10.78/russek/" (No longer active) Two images were found there: a confidential memo and a satellite photo of Casablanca. This is what was found before the password was changed. continuing our discussions in person. We shall speak soon? All is in good order. Here is the original as it appeared with the html coding and routing information. It is unknown if the password means anything or works anywhere. signalost captured this DayforNight site map. There may or may not be information pertaining to the puzzle on this map. It is definitely fun to play with. To navigate it, right-click on it for the zoom-in feature. If you tell Alisha "No man is an island" she says "What comes next?" then input "entire of itself" she says "Very nice. Then...?" input "every man is a piece of the continent" and she says "Last line?" put in "a part of the main" and i got this: "--Shepard? Go to http://209.61.191.196/temp4314401" (no longer active) On that site there was a huge JPG and a zip file that is some sort of program for detecting hidden files in jpegs. Both saved on this site. If you want to solve this part of the puzzle yourself, then go here. If you want to see how this part of the puzzle is solved, then go here. Thank you for your request. Password authentication is a process requiring that a lengthy set of criteria be met. If you are reading this mail, then your request for authentication has definitely been received, and you will be contacted at the e-mail address from which you submitted -- if, and only if, your credit profile exceeds our standards for clearance. "How It Pays..." to be patient, sometimes... And your patience is sincerely appreciated. Were you still interested in learning about our Credit-Smart plan? Speak to me sometime about ProgramD. If you know about ProgramD, then you are clearly with DProgram. But is "Yours" Credit-Smart? The above two email messages and chatbot response are enough to solve this part of the puzzle on your own. If they remove any of the links, then go here to solve it. Go here to find the solution. in future, you will please address all application requests to the appropriate division. authentication is proceeding smoothly. i believe this should be of interest to you. you will know what to do next. The clipping and heading are enough to solve that element of the puzzle. Or go here for the solution. Episode 8 "Time Will Tell"
The comment is: "Look closely where the gear meets the eye." That comment alone is enough to track down one part of this element of the puzzle. For the very resourceful, there is more to be found as was learned from signalost. Solution. There are no puzzle elements relating to episode 9 "Mea Culpa" or episode 10 "Spirit". 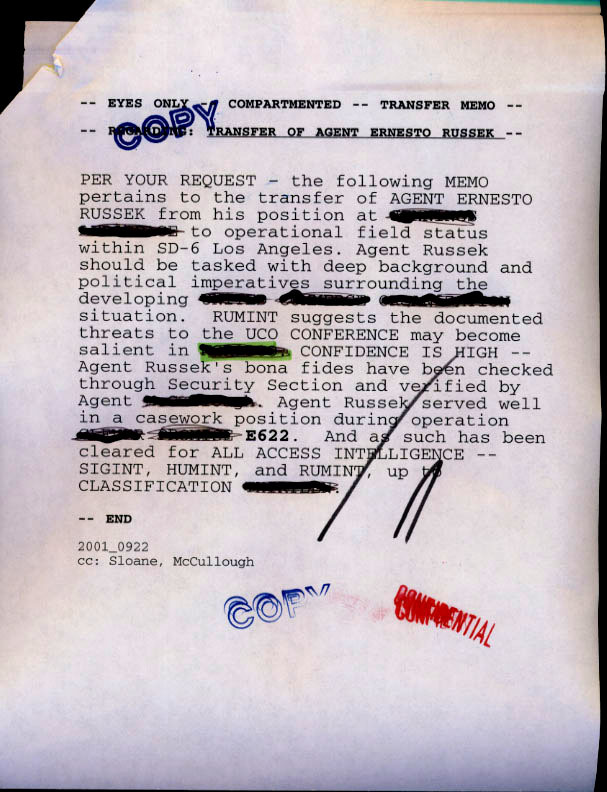 Pertaining to Task Agent 30408-31275, regarding the mishandling and storing of classified information, and password-protected audio inter-visual docs from an unsecured laptop computer. We believe the unprotected terminal in question was possibly used by agent's spouse to send and receive e-mail via a web server mail account, and user, or users, may have had access to several peer-to-peer file trading networks; both of which are potential security risks. It is not yet clear if any sensitive information was compromised. We are currently evaluating the extent of this breach. A full report is pending. Original copy with html coding here. Got an odd e-mail, though I'm not sure if it's connected to the game yet... but here it is. It came from sv@kolabs.ru (Russia?) The link in the e-mail leads to a wierd news page. Did anyone else recieve this? Here's a short transcript of a short chat with Kdirectorate on AIM. It looks like there's a whole lot of stuff that we're overlooking. [02:36 AM] Kdirectorate: There is so much you have yet to discover. [02:38 AM] Kdirectorate: R.F. is not an accident. [04:40 PM] switchflipper8: Do you know rulerfrog? be camouflaged to conceal their true meaning. [04:43 PM] switchflipper8: So who is "the watcher"? [04:43 PM] switchflipper8: Or what is it? [04:44 PM] switchflipper8: "tempus omnia revelat"
yourself with the "virtual" dead-letter box. [04:45 PM] switchflipper8: I'll go from there..
Then the reason for the "undercover" (by unityvice) page was discovered. Go to the briefcase, open up the briefcase and download the 'zip' file there. Guy: "Good afternoon, Jennings Aerospace." Caller: "Uh, yeah, hi, I'm looking for Joey's Pizza...?" Then it beeps into oblivion with some kind of scrambled sound/fuzz. There are two voices on the .wav. The male voice who answers the phone "Good afternoon, Jennings Aerospace." (older, strong male voice) and the caller (sounds younger...maybe a male voice in his 20's...sounds a little apprehensive, perhaps unsure of himself...?) who asks for Joey's Pizza. fyre did bring up the point that Jennings Aerospace is an SD-6 business cover and Joey's Pizza is the CIA call-in cover for Sydney. 13 15 20 8 5 18 and it allows you to leave a message. Willingthrall speculated that the numbers indicate letters in the alphabet. Using that theory the numbers translate to the word Mother. In the background can be heard Morse code -.- --. -... that signalost translated as KGB. At this point it seems relevant to revisit the 'dead letter'. password-protected audio inter-visual [sic] docs= the .wav file and it's password 'undercover'. Kdirectorate (5:10:35 PM): Stay the course. section one opr7 (5:11:17 PM): which course is that? Kdirectorate signed off at 5:11:50 PM. I saw kdirectorate on AIM yesterday. I said to her "KGB mother <o>" and she replied "tip of the iceberg"
This artifact was used in "The Box" part two. KDirectorate said "Remember... Hand to the eye." The image.jpg shows a picture of the Rambaldi clock's hour hand with an eye. I started looking into clock parts and mentions of eye and hands. The hour hand also pointed to 10, so i tried various combinations of 10:10 ten ten etc. and if a face is placed behind a clock, its eyes covered with clock hands would be 10:10.. but this got me nowhere. I decided to think simpler... since so far all the solutions to the images found were simple -requiring not much interpretation into it. So I looked at the image again.... hand to eye.... the hour hand on the image.jpg is marked with "<0>". so I finally tried <o> with camo and uncovered the hidden file inside. Also, the password to uncover the image is <0> -where the 0 is a zero not the letter "o". 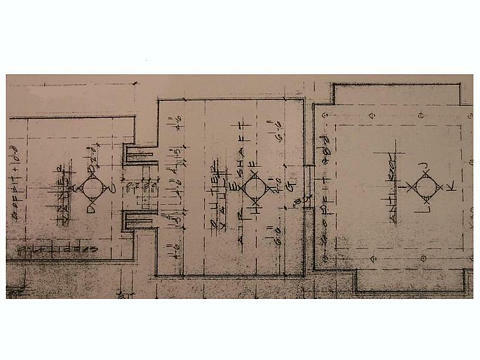 The image appears to be blueprints to a vault, possibly the SD6 vault on 'The Box' episodes. It's a jpg image labeled 474747.jpg and is 66 kb with a date of 6:11:11PM. It contains some kind of blueprint. The rulerfrog page as it last appeared before the Federal Shutdown [without the Buy the Moon or the watcher graphics] Thanks to signalost for this. Kursk Sunk By Test Of New 200 MPH Torpedo? FEMA - The Unelected Govt. RESOLUTION BEFORE THE HOUSE TO REINSTATE THE DRAFT! Secret Government Research - H.A.A.R.P. WEEKLY ANNALS NEWS GAZETTE Flying Rods - What Are They? Irish inventor claims of 'free energy' a hoax? Was the Moon Landing a Hoax? Because I am no HTML genius... You will likely need to view this page with a newer version of Netscape, Explorer, or AOL. Clicking on the above link **FINAL UPDATE: RAISETHEFIST.COM RAIDED & SHUTDOWN BY FEDS** (no longer active) took the player to the page below (Found by signalost on 2/5/02. It was last modified on 2/3/02) and had this in the source code: <p><!--USERNAME: thewatcher, PASSWORD: bypass --></center> That source code was meant to be found. After that, thewatcherz.com started using htmlock to hide the source code. LOS ANGELES - Heavily armed with high-powered machine guns, shot guns, and hand guns, the FBI, Secret Service, and Los Angeles Police Department sorounded the founder of raisethefist.com in his house. The founder was currently asleep, woken up by a relative who said fbi, police and undercover's were currently up and down all of the streets, with they're eyes focused on the premises. Raisethefist.com founder aproached the door were 2 FBI agents demanded that he step outside. Within seconds a swarm of FBI raided the house with automatic weapons and shot guns. Additional police and fbi also stayed on the front lawn, around the house with a door baracade and additional weapons. "armed and ready". FBI and secret service entered the house, seizing all servers and political liturature. Raisethefist.com was currently being ran within the founders room of the house, over a computer network. The room was literarly ransacked, and all equipment, disks, cd's .. etc. were boxed up, loaded into a truck and seized until further notice. Since 1999, raisethefist.com has been under extensive government monitering. At times, Raisethefist.com has recieved over 100 hits from the U.S Department of Defense in a single day. The FBI, police department, NSA (and who else) continuesly monitered the site on a daily basis. Even government's from the UK, Canada, Lavtia, Belgium, Egypt, Finland, and Australia monitered the site continuesly. The FBI had also previously intercepted all packets going through the DSL line hosting the site, and have seized additional accounts being used by the site. In yet another successfull attempt to silence our vioces, Raisethefist.com, an anarchist/activist independent media/collective has been shut down by the secret service. "It's not yet known at this point if the site will be back up. As of now, we have nothing. No more servers, no more network, nothing. My room remains completly ransacked. My neighbors remain shaken up by what happend. I most likely won't be getting any of the equipment back. They also took alot of my political litature. Apparently, they're excuse for shutting it down was the 'militancy' portrayed on the site. This is not true. This was an excuse. This same 'militancy' they were concerned about is portrayed on at least a thousand other web sites across the internet, and they havn't been touched by the federal government, with the exception for remote monitering. Raisethefist.com was progresive. It was going somewhere. Kids started creating clubs in their schools called 'RaisetheFist'. People started utilizing the collective as a powerful resource for the activist/anarchist community. The federal government has been investigating me, and the site very closely, long before 9-11, and long before such militancy was even portrayed on the site. They knew the site had potential, that it was turning into something more than a site, but a strong collective utilized by activists throughout the world committed to social justice. And that's become a crime. Justice has become a crime. Freedom has become a crime. Anyone activly disagreeing with policies of the U.S is now automaticly rendered a "terrorist" in the eyes of national security.... Where raisethefist.com will go from here, I don't know. Based on what i've been told, i'll most likely be in jail, so most of my focus will be towards getting an attorney." When players returned to the rulerfrog site the next day they found this. THIS SITE HAS BEEN SHUT DOWN FOR VIOLATION OF 18 U.S.C. ***disclose intelligence on communication techniques (18 U.S.C. 798)***, and identify covert agents (15 U.S.C. 421). Moreover, persons with a security clearance can lose their clearance and their job if they leak information. Local copy is here in case it is taken down. Even still, you may have to enter the username and password to finish loading it. Here are the rest of the Spy&Counterspy pages if anyone is interested. There are a few more mirrors out there, but this one seemed to be the most "current". website, are not valid anymore. dianthuscaryophyllus: Hey, good to see you upside. Read the paper today? Interesting article on page 1.
dianthuscaryophyllus: Don't worry, I'll send you the article right now. Hold on. dianthuscaryophyllus: Few too many pervs in here IMing me. Let's meet in the politics room next time. The comments about sending the article from page 1 of the NYTimes is spy-talk for "Here, I'm sending you a secret file." The sunsite link leads to this picture, that never proved to be puzzle-related. sky_watcherz profile is basically the same. There is a link to http://neverhome.camarades.com which is a webcam home page. It has a screen name of neverhome and the guestbook. The guestbook entries are archived here. If anything relevant to the puzzle is posted, it will be added here, too. sky_watcherz: Is that Beethoven's fifth? sky_wathcerz: Did you read the article? upsidedown3141: Thanks for the tip. sky_watcherz: If you need to contact me, I left instructions at the same place, ext. M31. According to Neverhome's links, there is a link to Yahoo personals. Yahoo Personals allows you to search for personal ads based on zip code and age range. Inputting the age range mentioned in Neverhome's webpage and placing the zip code found on dianthuscaryophyllus's profile, you get a personal ad. If you don't want to solve it yourself, then the results of the personal ad are here. Nothing that directly relates to this episode has happened on the puzzle. However considerable maneuvering has occurred 'behind the scenes' as it were. I'll attempt to explain it as best I can, bearing in mind that to do so requires some speculation on my part since very little of what has gone on can be verified as being in-puzzle. Referring to the guestbook introduced for episode 14 (the archive is here). Players were originally told to look for a call signal then follow a set of instructions. Well, something strange happened and it is unclear if what happened was by design or if some players got together and corrupted this method of contact. What must have been a bogus call signal appeared, then a flurry of accusatory messages followed and a couple web sites showed up for a few hours. Players were told they were being deceived by someone. Then one evening while a handful of players were surveilling the Yahoo politics chat rooms a few were contacted directly by Rulerfrog via Yahoo Private Message and given secret information and instructions. I choose to believe this development is part of a recruitment process by "The Watcherz". The instructions eventually led to a password protected questionnaire at the Watcherz recruitment site. keystrokes is a link to a zip file that contains a self-extracting file vault. Local copy. Met with rulerfrog online tonight. They invited me into a private room on Yahoo. Here's the log of the exchange. rulerfrog: Thank you for meeting with me. rulerfrog: You've been very persistent in pursuing the program lately. rulerfrog: I need to tell you something. rulerfrog: Would you like to hear it? switchflipper: Can you provide me with any insight on this 'program'? rulerfrog: Have you read this already? switchflipper: Yes, I've seen that. rulerfrog: The good news is -- The program is very far ahead of schedule, and we have almost collected all necessary information. rulerfrog: The bad news is -- The program will be officially terminated within the next week. rulerfrog: Please prepare the others. The Neverhome page changed. Some new links were added along with a mailbox icon. Local copy. The pertinent links were the Nostradamus link and the Numbers Stations link. There's an index of 5 HTML text images. Image 1 is Solario's Man with a pink carnation made up of 1's and 0's. Image 2 is Jan van Eyck's Portrait of Giovanni Arnolfini and His Wife made up of the first 4 digits of pi (3141). Image 3 is Pope Alexander VI made up of a sequence of 4's 7's and 0's. Image 4 is a portrait of Nostradamus made up of the first 4 digits of pi (3141). Image 5 is the Mona Lisa made up of 4's and 7's. 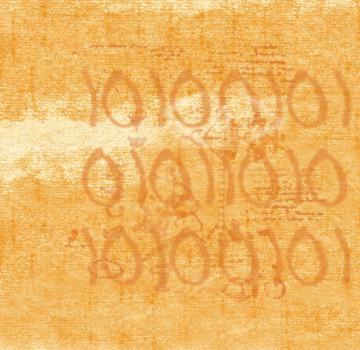 Also, in the episode, there was a code key on the painting. In the frame, to the left of Alexander VI's extended palm. Thirst and hunger when the comet will run. This 'prophecy' appears to relate to the weapon that Rambaldi was working on. Using the password to open the vault revealed this matrix of an alphabet shifted by a letter. Then this mp3 was discovered by mottjr2001 in file #5 of the Numbers Station. Listening to it, the following was heard. 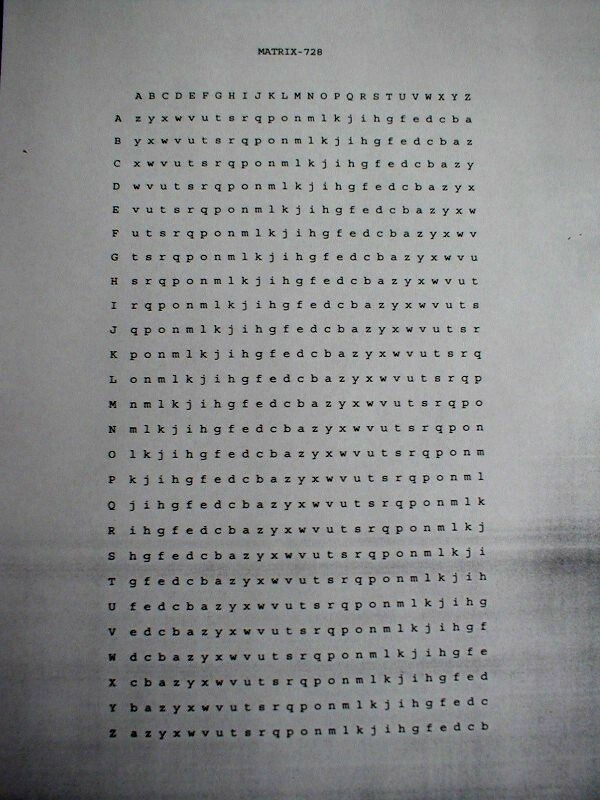 The above is the 'message' that is to be decoded using the Matrix. What was needed was a random set of letters to use as codekey. Willingthrall figured out that we already had a random set of letters in the collection of highlighted letters from the episodes. Then Willingthrall and Switchflipper decoded the message using the codekey and matrix. Mottjr2001 provided this brilliant explanation of how it was solved! At this very aptly named site (red rival = communist foe = kdirectorate) there are two forms. 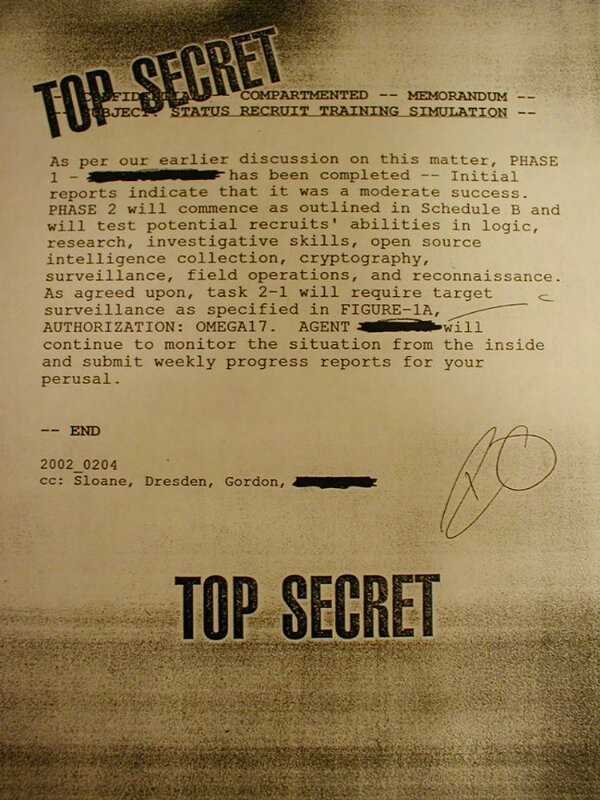 A standard one for players to fill out, and a unique one for the players who were contacted directly by rulerfrog and given specific instructions that led them a similar standard form a week or so earlier, and this top secret document.